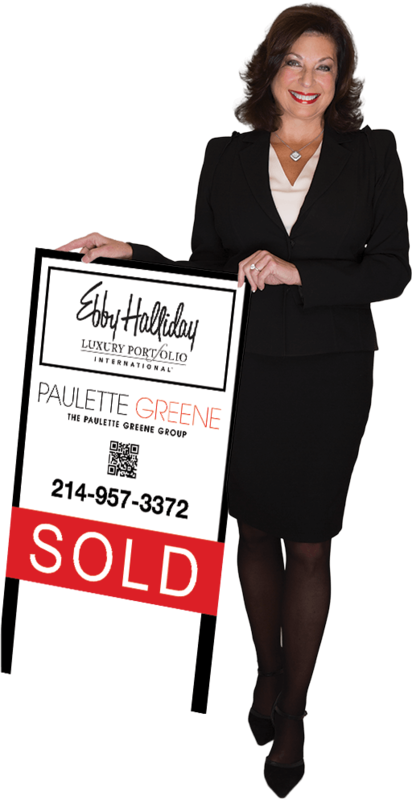 The top realtor in Frisco – Paulette Greene. Paulette has made a name for herself selling homes across Dallas/Fort Worth, TX and the industry recognizes it. Paulette has worked hard to become a leader in the highly competitive world of real estate. It has required years of proven results, involvement with local and nationwide builders, the growth of her business and personal network, and an intimate familiarity with all the neighborhoods and areas of Dallas / Fort Worth. So, whether you want to buy a house in Frisco or Plano, Allen or Richardson, from Fort Worth to Dallas, choose the only Realtor with Ebby Halliday who has won top awards in every single category. Paulette’s journey started with her belief that “doing the right thing creates the right results.” She is humbled by all that she’s been able to achieve. Paulette’s unmatched real estate expertise allows her to place families in the right homes in the right communities. You are only as successful as the people you surround yourself with, and everyone in The Paulette Greene Group puts their focus on you. An expert in helping families relocate to the Dallas/Fort Worth area, Paulette will help you find your dream house. Paulette knows her achievements are only possible through being of service to others.